I showed too, that Paint3D has a option to print, but you have to have the printer connected to teh computer and that is'nt our case. It's an extra step, but that should work. Doesn't Paint3D have an export option to save as STL-file? First save in the native format, so you don't lose the design. Then export to STL if that options exists. Otherwise, in addition to converting, you might also want to try other simple CAD programs? Maybe Tinkercad? I haven't tried it yet, but I heard that some schools use it. Maybe other programs too? For kids of +10y, you might try DesignSpark Mechanical. It is more technically oriented, but still very easy to learn. And there exist a lot of good tutorial videos. Google or Youtube for these programs, and watch a few demos, to see if they appeal to you, and to the kids. 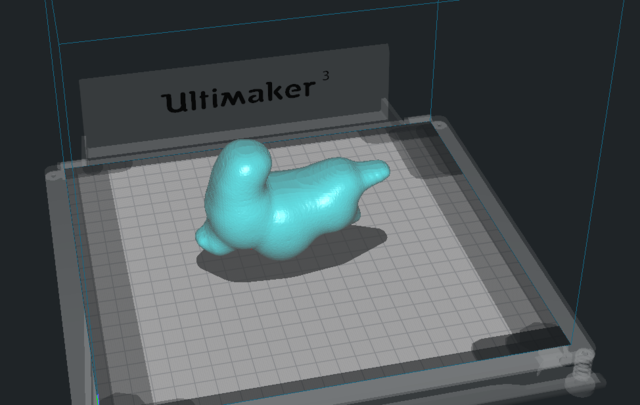 I just double checked the file; Cura indeed loads it correctly. Paint3D specified the file to be in mm.